Home » Supplements » BCAA » When Should You Take BCAA Supplements? 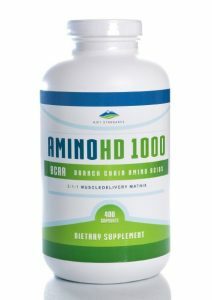 Branched chain amino acids are a highly popular supplement among professional athletes, bodybuilders and average fitness enthusiasts. Evidence has shown them to be beneficial in execise performance, muscle growth, workout fatigue and muscle soreness. One of the main concerns when taking a supplement is when is the best time to take a BCAA supplement to maximize its effects. 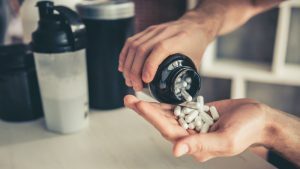 This article takes a closer look at when to take BCAA supplements (before or after exercise for example) and what is the window of opportunity you have to maximize their effects. 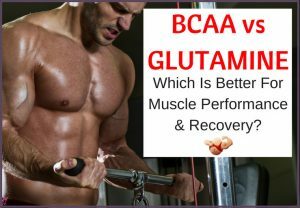 When To Take BCAA Supplements? 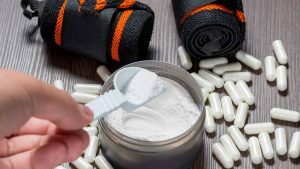 Should You Take BCAAs Before Or After A Workout? Is There A Window Of Opportunity To Take BCAAs? Do BCAAs Help If Consumed During Exercise? BCAA supplements can either be bought in powder or capsule form to be mixed with water or swallowed. BCAAs are 3 essential amino acids called leucine, isoleucine and valine. These amino acids cannot be produced by the body and must be consumed. Supplements generally contain twice as much leucine than the other amino acids isoleucine and valine. Most research is done on this specific ratio and this ratio is whatis present in the muscle. However you may find that ratios can be even more in favor of leucine with ratios such as 8/1/1 and 12/1/1. This is because some people believe leucine is much more relevant to consume in higher doses than the other 2 amino acids because of its more specific actions when it comes to stimulating protein synthesis and preventing muscle break down. Research is still being done to discover the effects of BCAA supplements compared to other products such as protein powders and whole protein sources that contain BCAAs within them. Some studies question whether BCAA has a verifiable advantage (​1), while other research shows that BCAA use certainly does. If anything, BCAA supplementation is a convenient and easy way to consume BCAAs before or after workouts in a measurable way. Studies have shown that BCAA supplements can help your fitness in several different ways. Improves exercise performance - Research has shown that BCAAs can improve physical and mental performance in exercise. BCAAs can improve exercise capacity, endurance, muscular strength and power production which all contribute to exercise performance (​2, ​3). Reduces muscle damage and soreness - BCAAs may relieve soreness but decreasing the muscle damage that occurs during exercise. Thus they could reduce the severity and duration of muscle soreness after a workout (​4). ​Increases muscle growth - BCAAs have been dhown to stimulate muscular protein synthesis and suppress muscle breakdown which helps build muscle (​5). Reduces fatigue during exercise - BCAAs have been shown to limit the amount of tryptophan that gets released into your brain. When BCAA levels are low trypothan is released which produces serotonin. This inevitability makes you feel tired and fatigued. Therefore if you keep BCAA levels topped up, tryptophan isn't released and fatigue or the feeling of being fatigued is delayed. You shoudl be able to push harder for longer. Provides a fuel source when glycogen is depleted - BCAAs can be used a source of energy when glucose levels become low. There has been some research done to show the best time to take BCAA. One study looked at BCAA use before and after exercise. In this study men took 10 grams of BCAAs before a strengthening exercise for their less dominant arm. They experienced less muscle soreness after exercise and lower bnlood markers of muscle damage compared to the group who took BCAAs after the exercise (​8). Another study looked at the use of whey protein use before or after a workout. The whey protein contained 5.5 grams of BCAAs. Over a 10 week period, one group consumed protein before and one after exercise. They found that both groups hasd the same improvements in strength (​9). Despite these studies they isn't really anytthing to suggest when is the best time to take BCAAs. The first study suggests that taking it before will be beneficial to muscle soreness. If you workout in the morning on an empty stomach it may be more beneficial to you to take some before as you haven't had a meal. It may even be beneficial to take some after as well. If you have a pre workout meal before your workouts, depending on what it is, it may not be as beneficial to take before hand. Overall it would be worth experimenting to see when it works best for you. Research is quite mixed about when you need to refuel. One recent study has shown that eating before AND after a workout is the best option rather than one or the other, so maybe this is the same for BCAAs?. Many personal trainers believe it really doesn't matter when you choose to take it as long as you consume it within a certain window of time. Many people believe there is a window of opportunity to take BCAAs and that's when you need to take them. It's the same as when to eat your post workout meal (some will suggest that it needs to be done within an hour of exercise). BCAA levels in your blood peak about 30 minutes after consuming the supplement (which seems to be similar to other supplements such as beta alanine). Many would suggest that taking them 30 minutes before a workout would seem reasonable to help with fatigue during your workout. Research seems to be undecided on when the optimal time is to take them though. As suggested, with post workout nutrition, the long held belief has been to eat within an hour of exercise for maximum benefits to recovery and muscle building. Some research suggests that the window of opportunity after exercise is actually more like 5 hours than 1 (​10, ​11). This is backed up by one study suggesting that there is no difference to recovery when you consume nutrition straight after workout compared to 2 hours later (​12). If you tend to eat before a workout then when you take BCAAs or other nutrition may not be as important as if you don't (​13). The simplicity of using BCAAs means that experimenting before and after is easy to do. It would be much more beneficial to do this and see what works for you. Experiment taking beforehand if it's your only fuel before a workout and also experiment afterwards to see if it helps. In our article on the benefits of BCAAs, there was some research to suggest that consuming BCAAs during a workout could help performance, but generally it seems to help mental performance but reducing mental fatigue rather than improving physical performance. Even so, one of the many reasons people take supplements for exercise is because they need a mental boost. They need something to help them mentally get through a really early morning workout or an evening workout after ac stressful tiring day at work. Mental performance is half of the battle to having a good workout. Studies have shown that in order for BCAA supplementation to be effective, you need to be taking them every day and over an extended period of time. If you don't you will likely not see significant results or benefits from supplementation. It is also suggested to take the supplement every day even if you aren't working out. This seems to be a similar suggestion for most supplements. The suggested recommendations for dosing tend to be around 10-15 grams daily with a 2/1/1 ratio of leucine, isoleucine and valine. This could be take in 5 gram doses over the day. You could take 5 before a morning workout, 5 afterwards and 5 grams later in the day. You don't necessarily need to take all in one go and it may be more beneficial to spread it out. Always factor in what you are eating in your diet too, as you may be getting plenty of additional BCAAs from the food you are consuming. If you enjoy protein powder shakes, you will also be getting BCAAs in your diet that way too. The right dosage is important to ensure effectiveness of the supplement. Too little a dose and you may not have any benefits, too much and you may have side effects. Research isn't very clear about the best time to take BCAAs. It could be equally beneficial to take before, during and after exercise. Timing also isn't as crucial as maybe we once thought. The best way to know is to experiment with when you take your supplements. Remember though, long term daily use needs to occur in order to reap the benefits from this time of supplement, so try using and different times on an extended period each time to see what works best.